There's often a misconception that making a healthy meal takes time and is not achievable on any given day of the week. This post is meant as an easy recipe to counter that approach! A couple weeks ago, I was asked what my tips were to eat healthy while saving time and money. My answer was to buy seasonally whenever you can. Seasonal produce is generally more flavourful, affordable and needs little to be turned into a delicious meal. These carrots are the perfect example. I purchased them at the Evergreen Brick Works farmers' market here in Toronto and they made the most perfect lunch. I simply roasted them with olive oil, salt, pepper and herbs and served them alongside a sunny side-up egg and some crusty bread. With a glass of local fall apple cider, it's pretty close to the perfect lunch in my book! These baby carrots are so small and sweet that they barely need to be peeled and are so pretty on a plate with their different shades of oranges, yellows and purple. They're nothing better than a plate that screams autumn to make me happy to put on some boots, a warm scarf and make the best of falling leaves and crisp air. This dish can be made with many other vegetables: try roasting some baby potatoes the same way or turnips and sweet potato. For quick meals, I like to use baby vegetables, but you can also chop your veggies in bite-size pieces. If you're making this for dinner, add some roasted salmon on top, or a nicely seared piece of chicken breast - or for a lighter meal, try it as I did, with a couple eggs, sunny side-up. 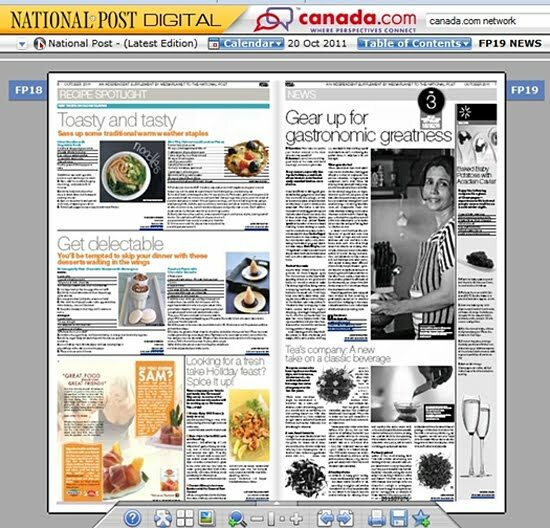 In other recent news, a couple articles I had been working on were published in the Food and Beverage section of National Post this week. I interviewed a few bloggers for the piece - Deeba from Passionate about Baking, Matt from WrightFood and Kevin from Closet Cooking as part of an article on kitchen tools, as well as MacKenzie from Grilled Cheese Social, about her love and passion for the world of toasted bread and melted cheese. You can take a look at the articles here! Preheat your oven to 400 to 425F. 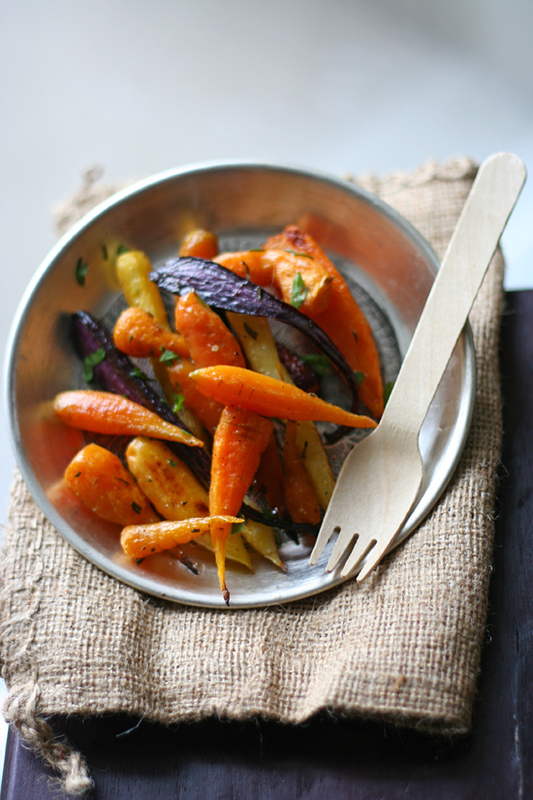 In a bowl, toss the carrots, a good drizzle of olive oil, salt and pepper and the herbs. Using your hands, mix the carrots to make sure they get properly seasoned. Lay the carrots in an even layer on a parchment-lined cookie sheet. Cook for 10-12 minutes or until the carrots are slightly browned and cooked through. Enjoy! Looks a healthy, perfect side dish. I love roasted seasonal vegetables. These look beautiful. I love the dish, so many colors. Very good photo!!!! First, I LOVE Deeba and Kevin and they are both incredibly talented coks/bakers! And great fun people! And I love roasting vegetables all autumn and winter long. I'd love to find baby heirloom carrots. Beautiful photo! I love such simple meals too roasted veggies, egg and toast... sounds so good!! Your photos have picked up the vibrant colors so beautifully. I think this dish looks simple, rustic and must be delicious!